Today is a symbolic date for world literature. It’s the anniversary of the death of Cervantes, the great Spanish writer, and the birth and death day of William Shakespeare. 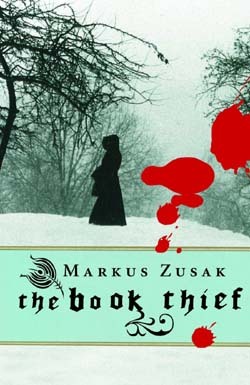 It’s also the day I will give away my beloved copy of The Book Thief by Markus Zusak in honour of World Book Night. World Book Night was launched in the UK last year and is making its American debut tonight. Thousands of volunteers from coast to coast will each give away 20 specially printed and publisher-donated copies of one of the 30 books on the WBN list. The grand idea behind all this is for book lovers to spread the joy of reading by handing out books they passionately love to light readers and non-readers. Of the thirty books listed for this year’s World Book Night giveaway, I’ve read seventeen, and own nine. My favorite is The History of Love by Nicole Krausse. I have two copies, one a hardcover, the other a much-thumbed paperback I purchased for a dollar at a library sale here in the City of Subdued Excitement. I was reading The History of Love on the day my first love called me up out of the blue 28 years after we first met so the reading of the book coincided with a life-changing moment in my life. I could never part with either copy of the book. My second favourite would have to be The Book Thief. As it happens, I have a hardcover in pristine condition, perfect for re-gifting. According to the website, World Book Night is all about spreading the love of reading, person to person. I’m not a volunteer in this year’s event but I was inspired to do a little book-gifting of my own. Tonight I’ll spread the love and place a brand new copy of one of my favourite World Book Night titles upon the doorstep of a neighbour. And pray that it does not end up in the recycling bin. Of the thirty books listed for this year’s World Book Night, which is your favourite? I haven’t read most of the books on the WBN list but I’m reading The Book Thief and enjoying it very much! I’ll have to work my way through some of the others on the list. I’ve read at least half the books on the list. My favourite would have to beThe Namesake mostly because it reminds me so much of my mother’s family. I love how the author was able to capture the distinct dialogue of each of the characters. Interesting that you’ve both chosen books that feature themes of ethnicity and family ties.